Are you interested in starting a chapter or a PMHA program? Click here to fill out our chapter application. Services delivered and communities built by peers with lived experience, for peers. What do LETS chapters provide? Mental health literacy is not enough. Raising awareness about mental illnesses without also addressing health disparities, cultural differences, inadequacy of mental health care treatments, insurance issues, and professional and clinical stigma is not enough. We must actively work to create accessible resources, reform existing oppressive policies, and understand that clinical and professional help does not work for everybody. We must actively support individuals with mental illness on college campuses, and not just shout into the void. The majority of our chapters are Category 1: Activist and Community Support Chapters. 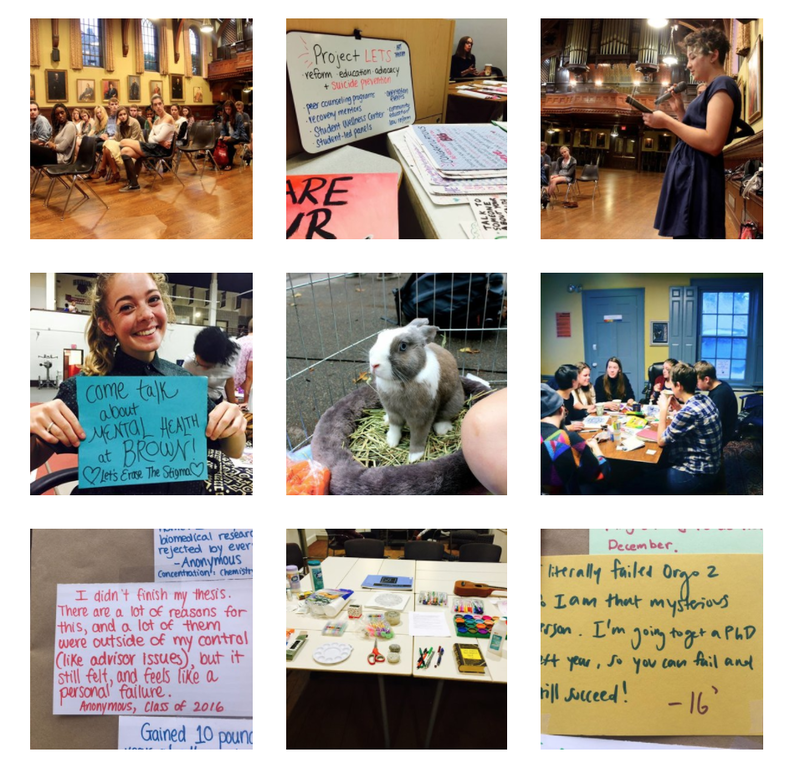 These chapters meet weekly, and prioritize building strong systems of support for their community (peer support). In addition, chapters engage in campus-wide activities, such as: facilitating student-led workshops + panels/discussions, reforming university policies, designing campaigns + initiatives (i.e. Eating Disorder Awareness Week), and leading LETS Spaces (i.e. Creative Arts Spaces). Though Project LETS has a handbook, guidelines, and sample programs - your chapter has the ability to customize + modify our materials to fit your community needs. All we ask is that you stick to our ethics and values. Currently, Brown University has completed a three-year pilot trial of our Category 2 program - The Peer Mental Health Advocate (PMHA) Model. Through this model, we train students with lived experience to act as counselors/advocates for their fellow students. Our service is free and confidential (including self-harm and suicidal thoughts) and we are not currently partnered with or embedded within institutional structures. Additionally, we allow students to choose PMHAs they identify with, and creates a visible network of 'out' students with mental illness. This innovate program structure offers: 1) one-on-one peer counseling partnerships; 2) assistance with self-advocacy efforts; 3) individual crisis response services; 4) facilitation of healthy coping mechanisms; and 4) linkage to resources. PMHAs participate in a comprehensive + rigorous training course for six-weeks - led by qualified student coordinators (trained by their National Coordinator). Read about our Brown University program, here.